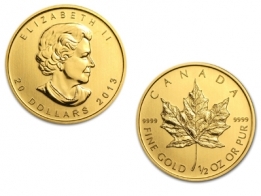 1/10 Ounce Canadian Maple Leaf Gold Coin. Brand new, 2019 edition coin. Each coin is 99.99% pure investment grade gold bullion. 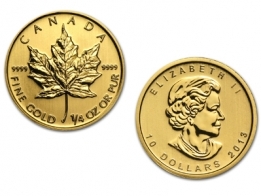 Each 1/10 Oz Gold Maple Leaf Coin has a face value of $5 CAD. The coin features an image of Queen Elizabeth II, with the coin's face value and year of minting printed underneath. The reverse of the coin features an image of a Canadian Maple Leaf. The weight and purity of the coin are printed around the Maple Leaf. The Canadian Maple Leaf coin is the most popular series produced by the Royal Canadian Mint, and comes in gold, silver, platinum and palladium. 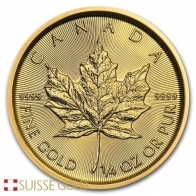 The gold Maple Leaf coin is available in 1/10 oz, 1/4 oz, 1/2 oz and 1 oz sizes. The Royal Canadian Mint also manufacture gold and silver bars for bullion investors. 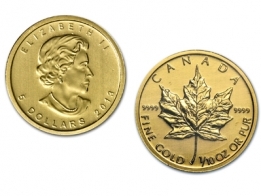 Canadian Maple leaf coins are one of the most popular gold coins available to investors today, due to their relatively low premium. Please contact us to sell gold Maples. View today's spot gold price.